Last night, a gang of hungry college kids arrived at my son's last minute invitation and we sprang into action. Short on time and several of the exotic ingredients, we riffed off the recipes to create simpler renditions: ie. in the eggplant dish (on the cover), we substituted plain yogurt for the mix of buttermilk AND Greek yogurt. Lacking za'atar, the Middle Eastern blend of thyme, oregano, savory, sesame seeds spiked with chile, we substituted a sprinkle of sea salt, thyme, oregano and hot pepper flakes. For the couscous dish, we roasted the carrots, parsnips and squash together instead of separately and substituted a good curry powder for the recipe's long list of cumin, coriander, cilantro, turmeric, and chili, etc.. Finally, we cut back on the amount of olive oil in both dishes. The whole dinner came together in less than an hour and was beguilingly bright, light and fresh. The recipes here are for 4, though we doubled everything last night; and you could easily triple for a crowd. Preheat the oven to 400-degrees F. Slit the eggplants in half lengthwise and score the cut-side several times with a sharp knife. Brush the cut-side with olive oil, sprinkle with the thyme leaves, salt and pepper and place on a baking sheet, cut-side up. Bake until the eggplant is very soft and browned, about 35 to 45 minutes. Remove and set aside. Whisk together the yogurt, lemon juice, garlic and salt and pepper to taste. Top the eggplant with the yogurt sauce, a sprinkle of the herbs and pomegranate seeds, and garnish with a few fresh thyme leaves. Serve warm, room temperature or chilled. Preheat the oven to 400 degrees F. In a large bowl, toss together the vegetables then add enough oil to coat. Sprinkle with the curry powder and toss to coat. Spread the vegetables out on a roasting pan so that they do not touch. Roast the vegetables until they are very tender and lightly browned, about 20 to 30 minutes, stirring occasionally so they don't stick. Put the apricots and couscous into a large heat proof bowl. Bring the water or stock to a boil then pour over the couscous and stir. Cover the bowl with a plate or plastic wrap and allow to sit for about 10 minutes. Using a fork, fluff the couscous and toss in the lemon rind and juice, scallions and most of the cilantro leaves, then toss in the roasted vegetables. Season with salt and pepper and more lemon juice if desired. 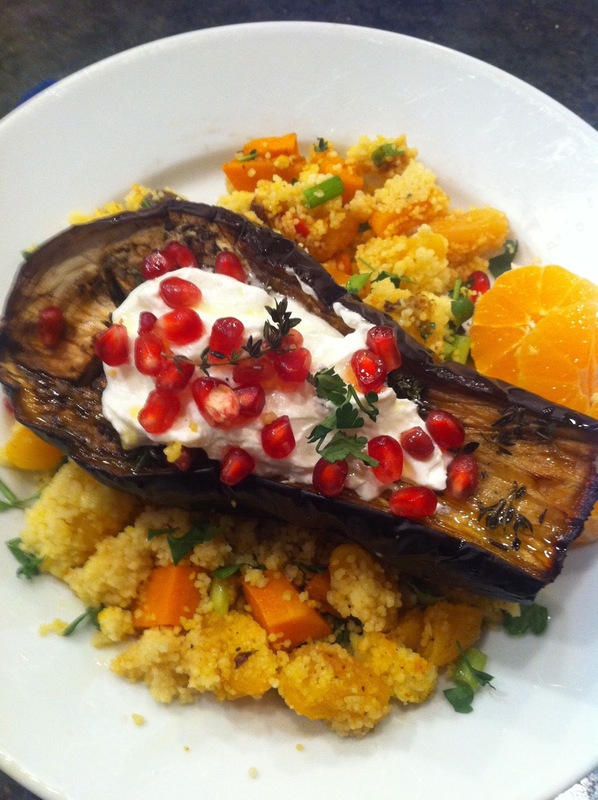 To serve, toss the roasted vegetables into the couscous, season with more salt and pepper and garnish with cilantro. This looks incredible! I love couscous but I usually have bulgur on hand, so I'd substitute it with that. The pomegranate seeds are fantastic this time of year! Hi Nicole! Thanks for your comment .. bulgur would be terrific. Let me know how it works out.